Definition at line 27 of file CQSpecieDM.h. 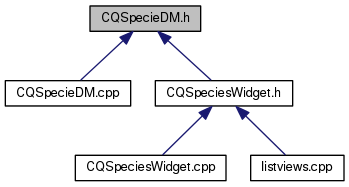 Referenced by CQSpeciesWidget::CQSpeciesWidget(), CQSpecieDM::data(), CQSpecieDM::flags(), CQSpecieDM::headerData(), and CQSpecieDM::setData(). Definition at line 31 of file CQSpecieDM.h. Referenced by CQSpecieDM::data(), CQSpecieDM::headerData(), and CQSpeciesWidget::setFramework(). Definition at line 33 of file CQSpecieDM.h. Definition at line 36 of file CQSpecieDM.h. Referenced by CQSpecieDM::data(), and CQSpecieDM::headerData(). Definition at line 29 of file CQSpecieDM.h. Referenced by CQSpecieDM::data(), CQSpecieDM::flags(), CQSpecieDM::headerData(), CQSpecieDM::setData(), and CQSpeciesWidget::setFramework(). Definition at line 35 of file CQSpecieDM.h. Referenced by CQSpecieDM::data(), CQSpecieDM::flags(), and CQSpecieDM::headerData(). Definition at line 30 of file CQSpecieDM.h. Definition at line 26 of file CQSpecieDM.h. Referenced by CQSpecieDM::data(), CQSpecieDM::flags(), CQSpecieDM::headerData(), CQSpecieDM::insertRows(), and CQSpecieDM::setData(). Definition at line 34 of file CQSpecieDM.h. Definition at line 32 of file CQSpecieDM.h. Definition at line 28 of file CQSpecieDM.h. Definition at line 37 of file CQSpecieDM.h.